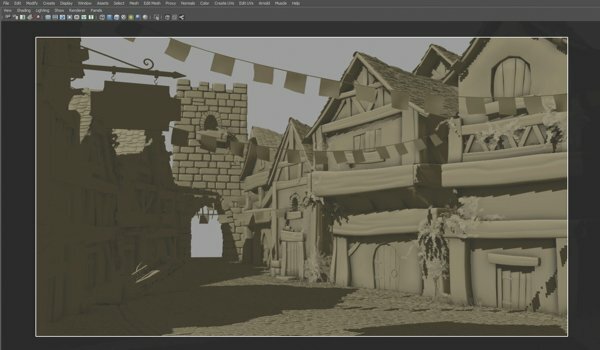 A short tutorial on modelling an exterior environment in Maya for 3D Artist. The tutorial was created in 2014. ...and this was the final textured and shader environment. In the viewport panel, go Panels>Perspective>New. Now go View>Image Plane>Import Image and load the ‘concept.tif’ image. In the attributes for the ‘imagePlane1’, check ‘looking through camera’ and ‘Attached to Camera’. Next, go Panels>Tear off to have this as a floating window to work with in your Maya scene. Begin using simple polygon cubes and cylinders to block out the scene. Create a camera to work towards and reposition these basic shapes to match your reference image. Export out the tower geometry as an .obj and import it into a new scene. Now create a poly cube and scale it into a brick shape. With the brick selected, go Edit Mesh>Bevel. Increase the Segments to 2 and play with the Offset to create a softer look. Next use the Insert Edge Loops tool to give us more detail. Duplicate this brick a few times so as to create a variation of bricks by pushing the points around. Start using these blocks to build up the tower. To help speed up the process of creating unique bricks, go Create Deformers>Lattice. Set the S, T and U Divisions to 2 and go into component mode to push the shapes further. As you build the tower up, think about the structure. Although we are not going for a fully realistic tower, we want to sell the idea that this tower had to stand strong. Make sure to analyse real buildings and walls and take notice of the formation of the bricks. Gathering and analysing reference is important as it will help inform and support your modelling decisions. Once the tower is complete, import it back into the main scene and export out one of the low-poly houses. Start by creating the roof by taking a polygon cube and extruding out the faces to create an upside down v-shape. Bevel the edges and then insert some edge loops. Select some vertices and use the Bend deformer to add some curvature to the roof. You can find the tool under Create Deformers>Nonlinear Deformer. Take a simple cube once more to create a roof tile. Duplicate the tile many times to create variations and then place them against the roof using the translate and rotate tools. For the wooden beams, again a humble bevelled cube was the way to go. To create the variations, I used the trusty lattice deformer once more. Then using the Interactive Split Tool, or my favourite the Split Poly Tool, cut into the beams and push in the edges to add grooves. The main body of the house also began as a cube; it was then bevelled and cut into for the windows and door. Add some extra edge loops so you can ever so slightly push and pull the vertices to break up the clean nature of the cube. Again, look at real houses and you should see the effects of time and weathering. Once I have the first house complete, I begin creating variations to fill the environment. By using the main house as a base, we can help maintain a similar feel to the piece as a whole. To make each house feel unique, play with the silhouette. Make some tall and thin and others short and fat. Alter the shape of the door and window frames and use the wooden beams to give each house its own character. From the poly cube, I created a bevelled cobbled stone. This was then duplicated to create four rows, and using the Soft Select Tool I made some variation to each cobble. These four rows were then duplicated many times, and again some small changes were made to break up the uniform, Bovis Home look that otherwise can occur. As you continue to build up the floor in this manner, you may find the scene file gets very heavy, very quickly. If that is the case, then alternative methods may be best advised, such as creating a normal or displacement map. A tower, some houses and a cobbled street gives us an environment, but to make this town feel lived in, we need to add some props. This could be market stalls, boot scrapers, horse trough etc. I’ve gone for a cart and some beer barrels, a pub sign in the foreground and some bunting running through the street. I found reference online to get some basic shapes and then pushed them further by using the techniques previously mentioned. Now let’s add some nature to our environment. This will help break up the man-made structures and again, make this place feel like it’s been here a while. For the grass, I used Maya’s Paint Effects. Just load up the Visor, found under Window>General Editors and scroll down to the Grasses tab. Have a play with the many variations of grass brushes until you find the option that suits you best. Once you are happy with your strokes, you will need to convert them into polygons. Select all of the strokes and go Modify>Convert>Paint Effects to Polygons (Options) Check Quad output and hit Apply. Do not delete the history on the grass mesh as we can use the paint effects settings to add movement to our grass later on. For the Ivy, I used the wonderful Ivy Generator by Thomas Luft. Now that we have all our assets, it’s time to bring them all together. One by one, import each house into the low-res scene that was first created. Spend some time rearranging the houses as well as the props till you are happy with the composition. To help frame your work, turn on the resolution gate to the camera. If you are finding that the assets are too heavy to manage altogether, try using Referencing. You can think of Referencing as pointing to another scene file without actually importing it in. Any changes that you make to the referenced file will also update in the file that already has the assets referenced in it. It’s a fantastic way to work and I highly recommend anyone not used to referencing to look into it. Till next time, happy modelling.